Change your own tire ? Harbor freight has good deals. An important item is a large flat plate to support the jack if not on concrete. Maybe 12" x 12" 1/4" thick steel plate or 2" wood but you might still need a 6"x6" 1/4 steel so you don't split the wood. Check with local shop offering welding or tow hitch install as they many times have scrap pieces available. If jacking, be sure to set brake and block the tires front & back so the RV can't roll. Whenever I change an outer dual I run a couple lug nuts on the inner (hand tight is good enough) as soon as I remove the outer, just to keep one wheel under the coach in case something slips with the jack. If changing the inner dual I temporarily use the outer tire as safety backup. I strongly suggest you get a service truck and let them wrestle the 150#+ tire and wheel around. Also it is important to remember if you have lost more than 20% of your air in any tire it is considered flat and if you drove any distance on it you may have damaged the body and it could explode when re-inflated. Inform the tech and let them inspect and re-inflate or replace. This could result in injury or worse. Should you "plug" your tire? This is an oldie but goody. I was just asked about plugging tires. This is a very important post. Improper repair can lead to a false sense of security and even to a tire failure which can cause damage or even injury. Please read this entire post. I recently read a statement that could be misleading as it is not supported by any of the major tire manufacturers or the National Highway Traffic Safety Administration. The writer said that “plugging a tire can work well.” This is just as true as making a statement that you can play Russian roulette and survive or you can beat the odds in Vegas or you can survive jumping out of a plane without a parachute. Guidelines for proper repair of a tire for highway use are available from a number of sources. Your well-being may depend on following these guidelines from NHTSA. If you don’t trust NHTSA, How about Goodyear? “It is crucial to know when it is okay to have a tire repaired and when a tire should be replaced. If a tire loses its air pressure, it must be removed from the wheel for a complete internal inspection to be sure it is not damaged. Tires that are run even a short distance while flat are often damaged beyond repair. If you don’t like Goodyear, maybe Michelin? 3. The puncture is less than ¼"
However, you need to have an authorized tire retailer or technician remove the tire from the wheel and inspect the tire from the inside. This inspection is absolutely necessary because internal damage is not visible while the tire is mounted. OK, not Michelin, then maybe Bridgestone Firestone? “Tread punctures or penetrations left unrepaired may cause irreversible tire damage. An improper repair can damage the tire and will void the warranty. Here is an example of a tire with three plugs and the owner also used a sealant that goes through the valve, all in an effort to save a couple of bucks. Here you can see the cracks through the interior rubber of the tire from driving hundreds of miles on an under-inflated tire. This tire had a piece of wire sticking into the air chamber. You can see where it was wearing through the interior. 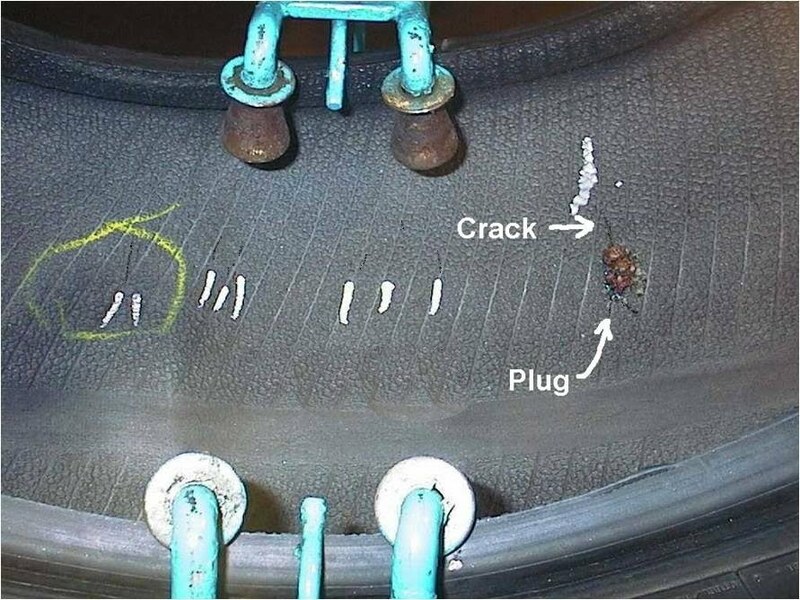 None of these “repaired” tires were dismounted as instructed by tire manufacturers but each had a cheap, improper plug repair made by someone that thought they knew something about tires. I will leave it up to you to judge the quality of the suggestion that a plug is acceptable repair and "can work well". As you can tell this topic is a “Hot Button” for me as I have seen entirely too many improper repairs done by the uninformed in the name of saving a couple of bucks. Ron, you didn't say the brand tires. To my knowledge all major brands except Michelin have the same info for load & inflation and Michelin is same on maybe 95% and those that differ may only differ by 5 psi or so. Since you only have total for an axle and do not know the heavy side we estimate one side at 53% -- So Front would be 6,042 and rear 8777 (4,389 per tire). Most 295/75R22.5 LR-G need 110 to support 6,175 F (single) and 80 psi to support 4,540 in Dual. Since I recommend a +10% of air for a good margin, that would suggest 121 psi front and 88 for the rear. BUT a LR-G is only rated for 110 psi so you need LR-H on the front. Also need to confirm the front wheels are rated for 120 psi and since even H are only rated for 120 that makes the recommended Front inflation 120 psi. Clearly the estimate of 53% is causing the problem so it increases the need for you to learn the actual side to side load on the tires by going somewhere other than CAT truck stop scale. It is CAT policy to not do one side weights and that is why they are making it harder to only get one side on the scale. I checked around home and found a local building supply that had a scale that would give me 4 weights for $10. Only about 3 mi off I76 just East of Akron OH. Read this on an RV trailer forum, but most of the info applies to all types of tires. "My understanding is that there seems to be a belief or a known orthodoxy that despite external appearances, the inside could rot out and that tires that appear all fine and dandy on the outside, after that long are not on the inside? People have owned tires that appear fine that are "old yet all seems fine", and they experience unanticipated tread separation and such....several anecdotes to the point of it being a "common wisdom" best I can tell. Beyond that, I have not seen a "more objective" verification of this...in my mind, after the death of such an "old yet otherwise in good shape and used properly" tire, an autopsy of that tire could show evidence of this "rotting from the inside"....I am not sure anyone has posted details about what that would look like (beside unexplained otherwise tread separation)? Absence of such "more objective review", I am very very inclined to accept the common wisdom or orthodoxy on this matter until clearly proven otherwise as the cost of being wrong is potentially massive comparatively!!!!!!!!! Many many posts on this site have expressed huge regret about pushing past such "widely accepted advice"
I did "tire autopsies" for decades before retiring. I have even posted pictures on my blog and have over 30 posts that have "Failure" as a label. Best advice I can give is to read and review the information on my blog. Listen to the only two (to my knowledge) actual tire engineers on RV forums: myself and CapriRacer. "Dry Rot" is a misnomer. Rubber is a long chain polymer. The chemistry is such that the polymeric chains break down over time. The rate the chains break is related to heat and other energy (UV) input. Nothing is actually "drying out" or "rotting" in the common understanding of the word. Sidewall cracking (dry rot) is just a symptom that suggests the internal rubber compounds have probably lost some of their elasticity, which increases the potential for cracking, which may lead to separation. There is no single answer to why some people have longer tire life than others except for the fact that some operate their tires at higher temperatures (load, speed and inflation plus ambient temperature) than other people. 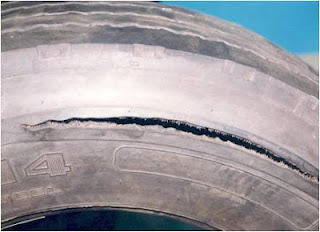 Any tire can fail with a Low Inflation sidewall flex failure or "Blowout". Radial tires in trailer application are exposed to significantly higher Interply Shear forces due to suspension design that the tires on the tow vehicle - See my post on Interply Shear. While operating a tire can help the "Anti-Oxidants" or AO's migrate to the surface, simply driving the tire is not IMO an efficient or effective thing to do, especially when we consider that cleaning of the tire sidewall, which will remove the AO's, can result in more harm that any driving around can prevent. How many of you have bothered to make load and inflation adjustments necessary for driving your ST type tires any faster than 65mph? Do you even know the actual loads on your trailer tires? How many do an annual "free spin" inspection of your trailer tires? How many are running TPMS (tire pressure monitoring systems) so you get warned when you drop down to the minimum inflation needed to support the measured tire load? If you feel that checking your pressure with a hand gauge is sufficient, do you make that check every 10 to 15 minutes of operation? If you have a tire leaking air you can destroy it in just a few miles, so the fact you checked the air 4 hours prior to the failure is of no importance. Sorry for the rant but the FACTS are out there. It takes a little effort to drastically reduce the potential for premature tire failure. There is no magic snake oil spray that will make your tires last 20 years. There are steps that you can take to get 5+ years of life in trailer application and 7+ in motorhome and tow vehicle application. What should I do? I had checked tire pressure the day before and only drove about 750 miles when the right rear inside duel blew resulting in damage to the MH and the tow. Only the side wall blew and the tire stayed on the rim. This is the first time in over 25 years of RVing that I have ever had tire trouble. I only had about 14,000 miles on these tires that are less than 2 years old. I bought the best tires they recommended. I will not say the brand but it begins with M.
I had pressure set at 120 psi and they were filled when the tires were cold and had not been driven for over a month, Should I be concerned about the other tires? Should you be concerned? It depends. Why did the tire fail? If the failure was a sidewall flex failure (sometimes called a "zipper") from running low then there was most likely an active leak, i.e. puncture or leaking valve core would be on the top of my list. In this case the other tires are no more likely to fail next week than they were last week with one exception to be covered in a moment. If you take the failed tire to a heavy truck tire dealer for the brand involved they should be able to confirm the mode of failure. Since you were not running a TPMS (tire pressure monitoring system), all we know is that probably sometime between checking the tire pressure and 750 miles later (2 days?) one tire had lost most/all of its air. We also know that the outer dual was run with possibly 100% overload so it probably sustained internal structural damage that shortened its life (months or years). Since we do not know how many miles at what % overload, it is impossible to predict -- so the suggested best practice is to replace the companion dual. One thing we can do is to use this as a learning experience. With a TPMS a driver would get early warning and many times can stop before a tire is damaged and, by extension, avoid damage to the RV and even not damage the mate in a set of duals. 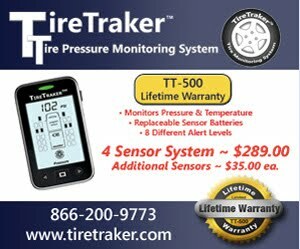 A single warning in the life of a TPMS (years) could save much more than the cost of the system. Now as to the other possible reason for a tire to lose air. It is possible for a piece of grit to get into the valve core and allow air to leak. 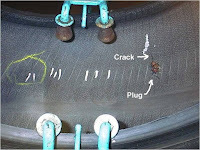 I suggest you review the posts on "Valves" (list to the left) and you can see an actual example of a leaking tire and the grit that caused it. So, as I have pointed out in the past, the very act of checking air pressure can sometimes result in a leak and potentially a failed tire.